This line ran from Havant station to Hayling (the south of Hayling Island), Hampshire, England. It was opened in 1865 as a single track line with no passing loops and was one of only two fixed links to the mainland. It passed over Langstone harbour on a wooden viaduct with a swing bridge in the middle. The main reason given to close the line was the condition of the wooden structure. After closure, the wooden viaduct was removed leaving only the pillars on which it was mounted in place today. Four trains an hour travelled between Havant and Hayling and these were very popular. The lines closure in 1963 has resulted in only one fixed link to the island (the road bridge at Langstone). The line of the railway has now been converted to a footpath and cycleway. It is hoped that the signal will be restored to commemorate the 50th anniversary of the lines closure. The web site has just been launched. Please visit http://www.haylingbilly50.co.uk/ to keep up-to-date with what is happening. The website includes a forum where you can register and post comments/images of your memories and comment on the project. 1930's out of copyright map of the route of the Hayling Billy Line from Havant. The dotted line running vertically down the page is the single track 'Hayling Billy' Railway which alas is no more. 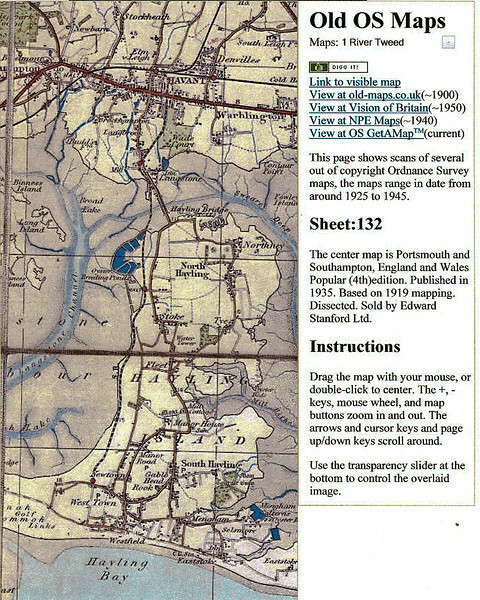 I found this website very useful in providing old OS maps.